Do MEDIC First Aid training programs follow American Heart Association® (AHA) guidelines? Yes. MEDIC First Aid training programs follow the most recent International Consensus on Cardiopulmonary Resuscitation (CPR) and Emergency Cardiovascular Care (ECC) Science with Treatment Recommendations (CoSTR) as well as the AHA Guidelines for Cardiopulmonary Resuscitation and Emergency Cardiovascular Care. Yes. Internationally 0ur programs are accepted as substantially equivalent to the AHA, American Red Cross (ARC) by regulatory authorities. Are training programs approved by OSHA? The Occupational Safety & Health Administration (OSHA) does not approve first aid or CPR training programs, instructors, or trainees. However… our programs help organizations comply with national laws, industrial training and OSHA requirements for workplace health and safety training. Can I be held responsible if something bad happens to the person I am helping? The International law states that a person offering aid must do so in a reasonable and prudent manner within that person’s level of skill and must ask for victim’s consent before anticipating any physical action. Furthermore, once a person had begun care the law states that care must continue until other help of an equal or greater skill level is obtained or until the rescuer had reached a level of exhaustion that makes continuing impossible. This is a common fear of newly trained people. The course designed by MEDIC FIRST AID is effective because the seeing, hearing, doing method of training increases the retention of skills. You may have heard stories that these skills come back when faced with a situation that you’ve practiced in class. How can I be sure I’m prepared to deal with an emergency? In addition to having the MEDIC FIRST AID pocket manual handy, ensuring that you have the appropriate barrier products will help you prepare for an emergency. How often should I refresh or update my skills? Refresher Requirements: For basic and/or advanced first aid courses, we do recommend to refresh complete course after one-year. But CPR and AED skills should be refreshed after every six-months. Retraining Requirements: Retraining Requirements vary from company to company, but we recommend retraining every two years, if not more frequently. For course specific requirements kindly see course brochures. Is there a minimum age to take a CPR and/or First Aid course? Age is not a reasonable measure of an individual’s ability to learn or perform CPR or first aid. A person of any age who has the physical ability to perform the required skills (ventilation plus compressions or hands-only CPR) may participate in these programs. Instructors bear the responsibility of ensuring that each participant meets the core knowledge and skill objectives for successful completion. Blended Training combines the convenience of online learning with a shortened practical skills session in order to meet both knowledge and skill objectives for learners. From where I can learn and practice life saving skills to complete my certification? Our training center is the only approved training center in Pakistan which offers Blended Training Classes and can arrange practical sessions. In fact the blended training session will only be started when student acknowledges the location which is offered by training center to appear for learning and exhibiting the skills to get the certification. The successful completion of course depends on completion of online learning and practical assessment of life saving skills by participant those will be assessed by instructor. Completion of the online portion alone will not result in successful certification. How I will learn theory part of the course? Online learning platform provides flexibility and self-control for the learner and convenience. This specially designed web-based learning system allows for a variety of sensory interactions to provide users with a low-stress, easy to use, and convenient way to learn cognitive information. Also, online support from approved instructors of training center will be available to all learners. How do I give feedback on training course? Students have two options to record their feedback on training courses. One is to go for online feedback and the second option is to complete an evaluation at the end of the course and hand it over to training center director for official record and filed to head office as well. Do every organization need to have AED Program? In Pakistan to set up AED at workplaces is not a regulatory requirement. But most of the companies implement this program to save lives of their workers. Now the requirement of this program depends upon the nature of business and working area and/or remote locations. Do you offer long term training services contract for a company which have employees all over the Pakistan? Yes, we do offer such long term and/or short term contracts to train all of the employees or as required in all over Pakistan. If you did not find answer to any of your question(s), let us know by emails and/or phone calls to information given in Contact page. What are these Communities Training Programs? These training programs are especially designed for community groups or organizations, medium and high grade schools, and for higher education students. What is the main purpose of having these programs? These training programs can help to increase the awareness about Sudden Cardiac Arrest and how every individual can play his role to save a life. If you attempt to perform CPR on an unconscious victim then remember in your mind that you can’t do any further harm to him/her but can only help. Unfortunately, very less number of those people, who experience a cardiac arrest at home, works or in a public location get that help. This is why we want to increase awareness in our schools, colleagues, university, educational institutes, community groups/organizations to help our cause to reduce deaths because of Sudden Cardiac Arrest (out of hospital) and save lives while performing CPR. Is it possible if I want to skip any course and plan for the same course in any other city or scheduled month/date? Yes, you can do this but you have to send us your request in writing 15 days before the planned event and can select same course planned in near future without any additional expenses. We want to clear one thing here is that the course fee for courses announced in Karachi may differ from the courses we offer any other place in Pakistan. Hence, in this case we may ask you to submit remaining dues, if you want to attend any course in Karachi. What if I don’t agree with TC Policies and don’t want to sign “Release and Hold-Harmless Agreement & Statement of Understanding” documents? The agreement with these requirements is mandatory and we can’t register any student who is not willing to sign these documents. 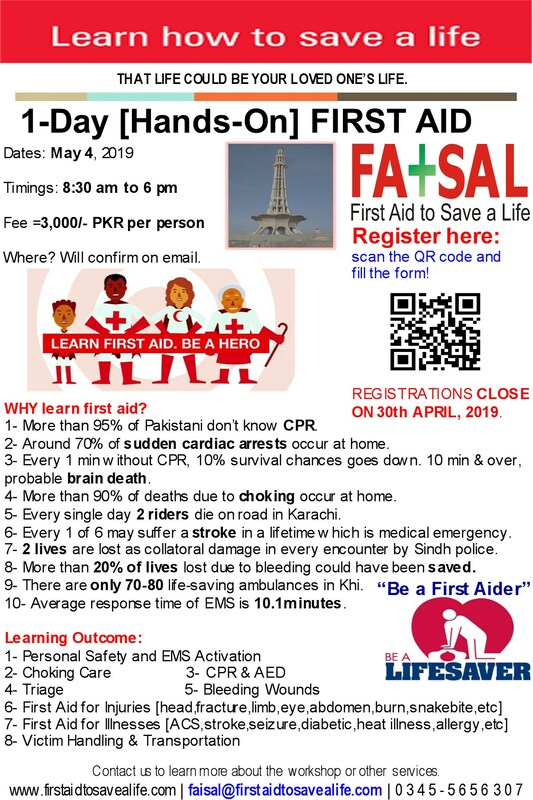 There is nothing serious in these document else we have highlighted some risks are inherent in these trainings but our instructors are well trained to handle such scenarios that is why they are representing Pakistan and international brand of MEDIC FIRST AID in Pakistan and all over the world. Also, the letter of understanding is to clear that you have no doubt in your mind about infectious body fluids and blood that may (or can) cause disease when anticipating any emergency scene. What are the prerequisites for attending your courses? Oxygen First Aid for Emergencies. Other then above there are no prerequisites for any other course. Upon successful completion, the participants will get certificates having 2-years validity. Also see above for refreshment requirements. Is there any dress code for participants? Casual and comfortable clothing is welcomed. You will be practicing skills that require working on your hands and knees, bending, standing, and lifting. If you have any physical conditions that might prevent these activities, please bring it to the attention of the instructor at beginning of course. We will work to accommodate your needs within the stated course completion requirements. Chewing gum is prohibited and it is also recommended for hygiene reasons to remove lipstick particularly during CPR training. What happens if someone fails? There are no exams in our one day courses. We include written exams only if course is consists of 2 or 3 days or any longer version. But in any case this is what we cannot expect from our courses and to avoid this and meeting the general requirements for any professional courses, we are only enrolling 12 participants in one class. More than 50% of time is spent on practicals and each of them have to practice different roles like rescuer in individual capacity, team leader, different roles in group exercises, presentation of real life scenarios etc. We are very much confident when he/she joins us for and willing to cooperate with us to learn there there are hardly any chances he/she left less fortune and could not complete it successfully. If this happens then it is simply a matter of re-sitting the exam due to nerves and this can be accommodated for. Other circumstances require additional training or remedial training, which again if possible, will be catered for. In some instances there are additional charges for these services. What training is required for using a defibrillator? Our three courses do cover the use of Defibrillators. As far as the information we have from open market, we are the only one who provide students with AED trainer during our classes to practice it. Maximum training providers show videos on AED and this is final from their side. Can you do training on weekends and/or evenings? We do consider this as we want to facilitate our individual participants and corporate clients. But we don’t recommend professional courses in evenings as these courses demands full energy and we don’t want to compromise on the quality of education.